"The (state) Senate is not dysfunctional-it is nonfunctional. The problem is that neither the institution nor its members are accountable to 'We the people.' Instead members concern themselves with personal and partisan agendas." Sounds like California right? Well, this is a story about the New York legislature, which apparently is afflicted with the same paralysis and lack of leadership as our own. Written by Gerald Benjamin and Mario M. Cuomo, this column appeared in the Wall Street Journal and was brought to my attention by Ray Dezember, the retired banker who may singly be the most influential man in town. Affectionately known as "Mr. Bakersfield," Ray is known for his personal generosity and his deep involvement and love for our community. He passed this column along to me with a personal note saying California needs a state constitutional convention to get out of this mess. "Albany can show that it is genuinely interested in considering reform by putting the convention question on the ballot. Alternately it can ignore calls for change. This, of course, would further reinforce the cynicism of New Yorkers and push them further away from public life - and from democracy. If the legislature wants to avoid this fate, which is of its own doing, then it should take up the calls for reform." That's Ray shown in the photo below along with Californian publisher Ginger Moorhouse and me, shortly after Ray retired from our Board of Directors. * ... SAN JOAQUIN'S INDIAN CONNECTION: As reported earlier this week, troubled San Joaquin Bank announced a recapitaliization that will bring $38 million into the bank from a group of Indian investors. This is good news for the local bank, which has been under the screws of federal regulators who are concerned about "impaired" development loans on the books. CEO Bart Hill said the investment would be enough to stabilize the bank, but there are a series of steps that must be taken before the money can leave India and get to the bank. Meanwhile, the bank filed a "Form 8-K" which details the transaction, and this notes that San Joaquin can and will continue to look for yet more investors. If you're curious about this stuff, and want to read the names of the Indian investors, check out the Form 8-K here. * ... WAITING ON THE TOUR: Meanwhile, local cycling enthusiasts are waiting to hear if Bakersfield's bid to host a leg of the 2010 Amgen Tour of California will be approved. A large group of local business leaders, supported by the city of Bakersfield, are supporting this move to bring this premier professional cycling event to Kern County next year. This would be a sure-fire winner in terms of tourism and showing off our community, so keep your fingers crossed. If you want to keep up with the progress of our bid, check out the website here. 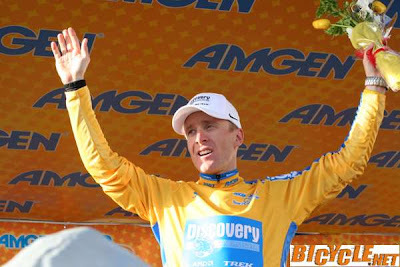 That's a photo of past winner Levi Leipheimer below. * ... A TOUCH OF OILDALE IN LA: Local photographer Felix Adamo passes along word that a gallery in Los Angeles is featuring six Bakersfield artists and their art of Oildale. The exhibit runs Aug. 1-29 at L2kontemporary, located at 990 North Hill Street, No. 205. Felix says one of the artists is our own Jill Thayer, North High and CSUB graduate. Make sure to check it out if you're down in Los Angeles. is that suit a rental?